Have you ever heard the saying, “Sticks and stones can break your bones, but words can never hurt you”? Words have the power to cut someone to the deepest part of who they are. When it comes to your relationship, your mouth can make or break your bond. It is normal to have the occasional disagreement or to have a bad day and say something you regret (followed by a sincere apology, of course). But if you or your partner have fallen into the bad habit of saying hurtful or passive aggressive things to each other, your relationship may be headed towards “Bye Bye” land! Some of these hurtful things work their way into your relationship in the form of “normal communication”. However, these subtle remarks can deeply hurt or offend you or your partner to the point where the relationship is irreconcilable. Make sure this isn’t you! 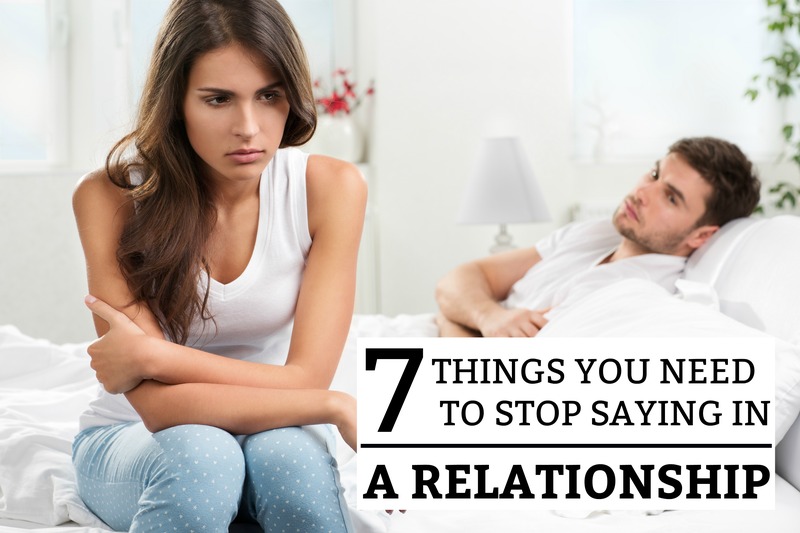 Below are 7 things you need to stop saying in a relationship! Do you really mean this? You really think “taking a break” is a good idea? If you are only using this as a threat, you need to stop! This is a childish and manipulative tactic that is absolutely useless when it comes to growing a healthy relationship. Did you know that “taking a break” also means “breaking up”! This break may give your partner enough time to realize that they are better off without you! It also gives your partner permission to move on and pursue someone else. Only say it if you really mean it. Pro Tip: If you are thinking about “taking a break”, read this article about toxic relationships. Maybe you’re in one and need to move on! No matter how annoying some members of your partner’s family may be, you need to think carefully before saying something rude about them. Family is family – and there is a special bond there, no matter how annoying they are. Even if your partner agrees with you, don’t do it! Why? Because your partner is bound to have some good memories about them. You don’t have those and that’s OK! But, let them keep those few good memories in peace. On the other hand, if you need to address something, choose your words wisely and say your piece. Just don’t fall into the trap of gossip and toxic negativity. These statements are “absolute” and make no room for exceptions. Saying these things to your partner immediately puts them on the defense because you are accusing them of something pretty serious. They will feel hurt and offended by your statement and probably remind you of all the times they DID or DID NOT do whatever you are accusing them of. In other words, it’s an offensive and pointless argument! Instead, carefully choose the right time to confront the issue or discuss a problem with them. Directly after they get home from work is not a good time! Sit down together and have a mutually respectful conversation. Don’t point fingers and make accusatory absolute statements. To have a constructive and productive conversation, you both must agree to listen and speak with care. And stop treating your partner like a child! The word “allowed” signifies that you have authority over them and all their decisions. The problem is, you don’t have authority over their choices and saying this to them will make them do XYZ all the more! You need to choose your words wisely when you feel like your partner is going to do something wrong, hurtful, or damaging to your relationship. They’re suppose to be your friend and you care for each other’s happiness. Choose an appropriate way to confront them and their actions. Don’t let the heat of the moment allow you to say something that will make you both angry! These “apologies” are not heartfelt, honest, or helpful. Actually, they make the problem worse. If you or your partner apologizes this way, your relationship is probably very unhealthy. A true apology states the wrongdoing, accepts responsibility, and asks for forgiveness. Without true forgiveness, healing will never happen. Your relationship growth will stop and your love will deteriorate. Tue love is kind and selfless. It apologizes and it forgives. Work on it and you will both find yourselves in a happier and healthier relationship! If you think that calling someone else HOT is harmless, you are wrong! By saying this, you are sending the message to your partner that you love admiring the physical qualities of someone else – not them! In other words, you have a wandering eye. If you don’t believe me, just go out and ask a random group of men and women what they think. Then ask their significant other. Almost every single time at least one of them will say that they are not OK with these type of comments! This is not a sign of insecurity! They simply know that they will never look as good as the person that their partner just verbalized his/her attraction to. Next time you see someone who is attractive, don’t say anything! There will always be attractive people in the world. But you didn’t choose them to go through life with. You chose the person who is walking beside you. A lack of words can do a lot of harm too! The good old ‘Silent Treatment’! Silence is typically used as a passive-aggressive tactic to anger the person you are talking to. This tactic is often used by narcissists, to make their victims pay for not doing what they wanted. Don’t be childish and refuse to talk things through, simply because you are offended or hurt. It is natural to either fight back or ‘clam up’ when you feel personally attacked. However, you must fight the urge to ‘go silent’ and try to finish the conversation. If necessary, just take a little time to cool off and settle down. When you both feel like you are able to talk through your differences, sit down and have a conversation. True is misspelled in the sentence about kind & selfless. It also says, “it down” instead of sit; however, I think the message more important than the petty critique.